OK one more thing before I call it a night. Who is soooooooo excited about this new show on ABC? 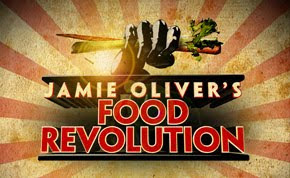 Jaime Oliver's Food Revolution. Well I am so excited that I could just flip. I have been seeing the previews for what seems like months now, but they have been coming on more and more frequently so I looked it up. The show starts March 26. I don't care if you guys watch it or not but it will just be a new show to watch from the comfort of my treadmill. OHHHHH snap, you thought I was gonna stay couch.